The second exhibition I visited yesterday while at The Higgins Bedford was Edward Bawden and his Studio. I greatly admire the work of Edward Bawden and this exhibition revealed new insights into his personal life that I was unaware of. I love being able to get up close to his prints, to see the marks he carved into lino and the impressive scale of some of the pieces. The exhibition documents Bawden’s time at three studios in his life – Redcliffe Road, London, which he shared with Eric Ravilious; Brick House, Great Bardfield and Park Lane, Saffron Walden, where he spent the end of his life. Highlights inlclude ‘The Pagoda, Kew Gardens’ – a very large linocut of the iconic pagoda, an earlier version of which featured on a Transport for London poster; ‘Peacock and Magpie’ – a vibrant colour linocut of an image from Aesop’s Fables and ‘Church and Thunderstorm’ – another large scale linocut of an atmospheric Saffron Walden church struck by a thunderstorm. Edward Bawden and his Studio runs until 28th January 2018. A brilliant exhibition for admirers of Bawden and for people interested in finding out about him. Yesterday I visited The Higgins Bedford to see two exhibitions, the first of which was Picasso and The Masters of Print. The exhibition is centred around seven prints by Picasso, each one displaying the various printmaking techniques he mastered. Picasso himself is credited with the reduction method of linocutting, which is demonstrated in his piece ‘Still Life with Glass under a Lamp.’ What is most impressive is that Picasso had no formal training in printmaking and his great skill is shown in the etching ‘The Frugal Meal’, which is only his second attempt at printmaking. The exhibition also displays work by artists who greatly influenced Picasso’s printmaking as well as some of his contemporaries and modern day printmaking masters. You can expect to see work by Durer, Rembrandt, Degas, Matisse, Miro, Paolozzi, Hockney, Rauschenberg, Warhol, Blake and Lichtenstein. My favourites included two etching and aquatints by Goya, ‘Simpleton About’ and ‘The Folly of Fear’, as well as an etching and aquatint by Paula Rego called ‘A Frog he Would a-Wooing Go’ – a gruesome fairytale image. I really liked the display of the deconstructed Mark Hearld photo lithograph ‘The Rooster and Railway Carriage’. It showed the many colour layers involved in the process. My favourite Picasso piece is the reduction linocut ‘Still Life with Glass under a Lamp’. The vibrant red and yellow, shapes that show the versatility of linocutting and despite it having four colour layers it has a relaxed feeling, as though he enjoyed cutting it and did not labour over it. The exhibition runs until 16th April 2017, try and catch it before it ends! 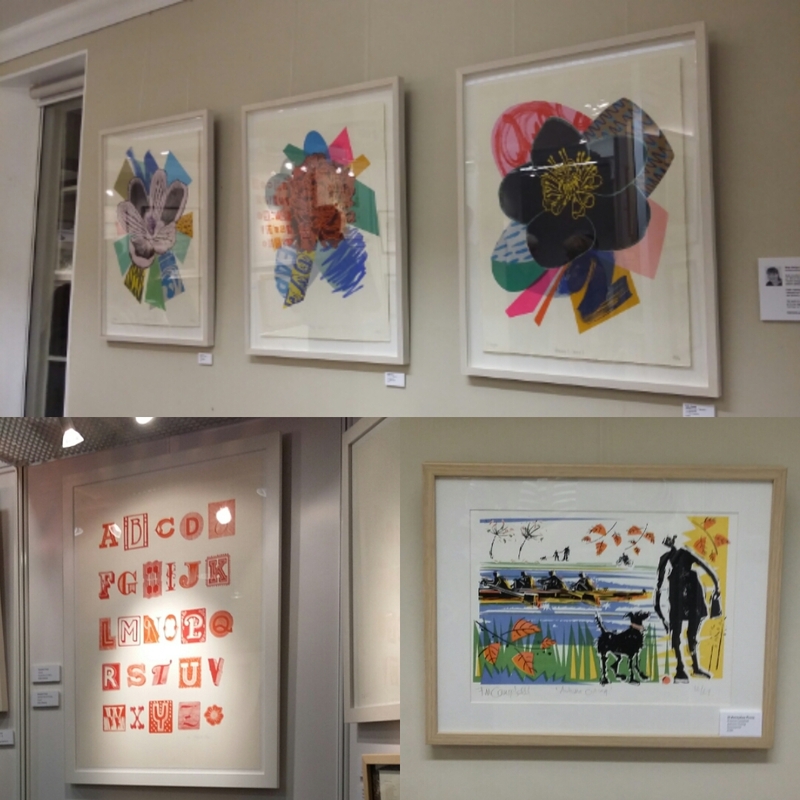 Last night I attended the opening of the Cambridge Original Printmakers Biennale exhibition. 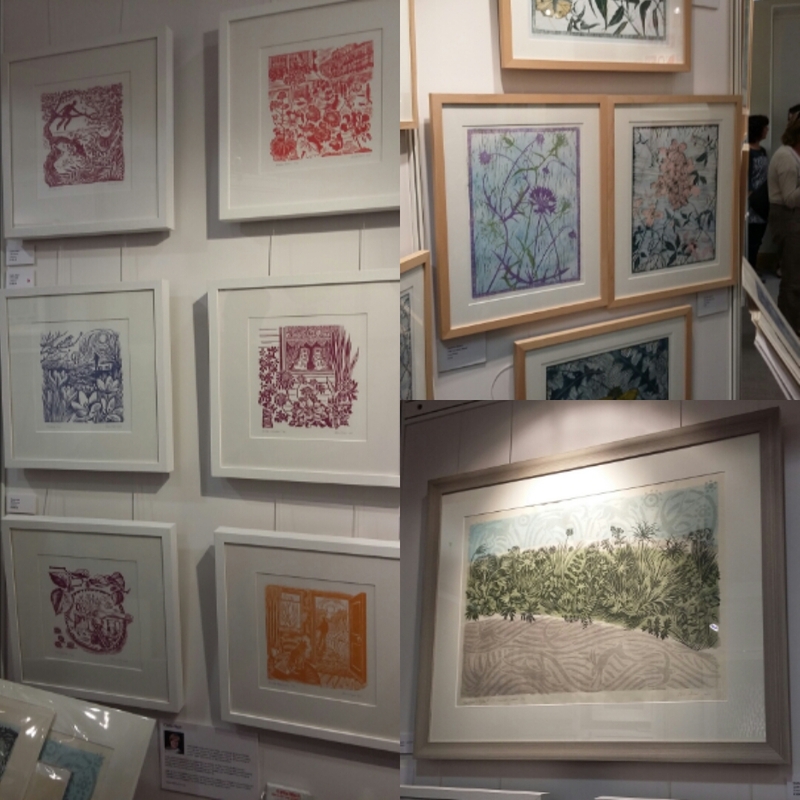 It is a lovely exhibition showing work by over 39 printmakers. There are a range of printmaking techniques on display, including etching, linocut, letterpress, screenprint and wood engraving. Highlights include A J Blustin’s atmospheric linocuts, Laura Chaplin’s aquatic screenprints, Elizabeth Fraser’s playful letterpress, Celia Hart’s East Anglian inspired linocuts, Alison Hullyer’s floral Chine-collé, Louise Stebbing’s incredibly detailed linocuts and Geri Waddington’s wood engravings of gardens and buildings. A variety of talks and demonstrations accompany the exhibition. It’s a great opportunity to learn about the art of printmaking and see some fantastic work! On Saturday I visited the Norwich Print Fair. It was my first time attending the fair and I really enjoyed it! St. Margaret’s Church on St. Benedict’s Street was packed full of brilliant printmaking and because I went on a Saturday most of the printmakers were there. 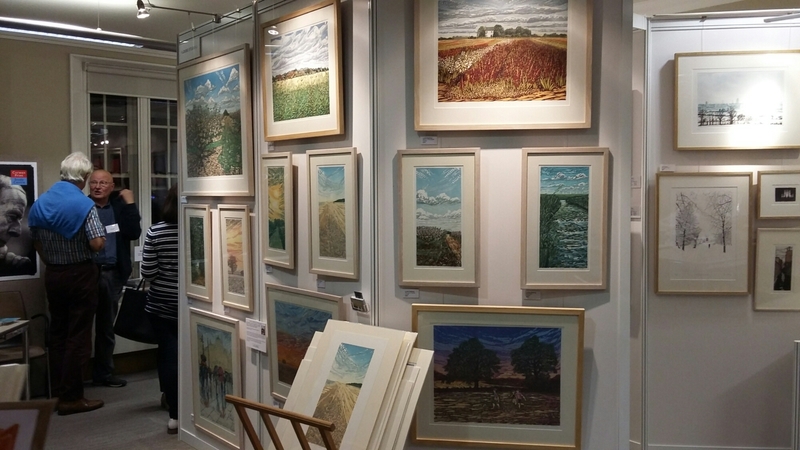 It is difficult to choose, but some of my highlights included Neil Bousfield’s engravings of the Norfolk coast, Vanessa Lubach’s linocuts of cats and chickens, Elaine Nason’s linocuts and Laura White’s etchings of family photographs. I am particularly fond of Richard Horne’s Print Vend machine, which has been filled with new prints! The Print Vend machine is full of little boxes containing a random screen print, if you do visit the fair make sure you have a go! Illustrator and printmaker, Paul Bommer was also at the fair. He had a lovely display of work including screen prints. I chose a print of Norwich Pubs, which I am very pleased with! Norwich Print Fair continues until Saturday 17th September. Saturday will be another open portfolio day where you get the opportunity to meet the artists and browse their unframed prints as well as the exhibition. I definitely recommend visiting the fair and hope to be back again! Whilst in Saffron Walden I visited the Fry Art Gallery. It is a brilliant little gallery, which houses original works by Edward Bawden, Eric Ravilious, Michael Rothenstein and Richard Bawden, to name a few. The main room has a display from the permanent collection called A Modern Sensibility, which features some impressive prints from Edward Bawden and Eric Ravilious. These were the highlights for me, especially Bawden’s Liverpool Street Station and Snowstorm at Brighton. It was also useful being able to compare the print of Brighton Pier at the Fry Art Gallery to the ones I saw earlier in the year at the Bedford Higgins. Another highlight was the set of lithographs by Eric Ravilious detailing life on a submarine. This display is available to view until October. The second half of the gallery was a special exhibition called Richard Bawden At 80. It featured prints and paintings by Edward Bawden’s son, Richard. I particularly liked the Christmas card designs and the cat chair! There were also a couple of small rooms, one of which contained other smaller Ravilious and Bawden pieces, including some lovely woodblocks by Ravilious, and a display of book covers by Saffron Walden based collage artist Michelle Thompson. I was really impressed with the gallery. It has such an important collection of artwork and anyone interested in printmaking should try and visit. The staff were very nice and there are some lovely books available to buy as well! Last month I visited Saffron Walden and went to the Church Street Gallery. I had heard about the gallery before going and made wanted to have a look. It is a lovely gallery with a strong focus on printmaking. I loved seeing all the different prints and talking to the very nice owner. Highlights include work by James Dodds, Mark Hearld, Neil Bousfield, Alison Read and Celia Hart. All work is for sale and there are a few other things for sale including books, I got a great book called The Printmakers Cat! A couple of weeks ago I visited Saffron Walden in Essex. I had been briefly before but this was the first time I had had a proper look round. My main objective was to visit The Fry Art Gallery, something I have wanted to do for a while, but I ended up seeing so much more! Firstly I came across a house that Edward Bawden used to live and work in. It’s an unassuming building down a small lane, but being an admirer of Bawden it was good to see all the same. After a visit to the church I visited Church Street Gallery and then on to The Fry, which I talk about in the next couple of posts. Saffron Walden is a lovely town with lots of history and interesting architecture. It has mazes, one being in the formal Bridge End Gardens, and a castle. However, what initially drew me here was the town’s association with some excellent printmakers and artists and I would recommend to anyone with a similar interest to visit Saffron Walden. All images on this site are copyright © 2016 Alyx Hardy. All rights reserved. Images may not be copied, reproduced, republished, uploaded, posted, transmitted, or distributed in any form without permission.